The Innovation Funnel is a mechanism that enables a constant stream of ideas that can be screened for viability. It’s a tool that helps companies and individuals to innovate successfully. This article provides a practical explanation of the Innovation Funnel. After reading, you’ll understand the basics of this powerful innovation tool. What Is the Innovation Funnel? The Innovation Funnel is a mechanism that enables a constant stream of ideas that can be screened for viability. The Innovation Funnel, also referred to as Funnel Management Process, is a popular approach for innovation that is used by many companies to create an innovative and realistic action plan. The core of the Innovation Funnel is to generate as many ideas as possible, a large portion of which will be refined and converted into concrete development plans. This creates a funnel-like shape, from lots of ideas to a few ideas. As the best ideas will remain, the Innovation Funnel is an excellent tool to prioritise ideas and ensure that the best will be fully developed and advanced projects, products, or other innovations can be launched. The idea of the Innovation Funnel originates from the world of sales. The idea was that it takes lots of potential customers to qualify for making a deal as a company, and that it takes lots of ideas and brainstorming sessions to evaluate whether a new product or service will be profitable. Henry Chesbrough subsequently changed the concept by making the funnel permeable. 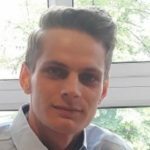 He came up with the term ‘open innovation’ and proposed that ideas can and must come from individuals within the organisation, but also from external customers and partners. The ideas enter the funnel on the left side. Ideas can exit the funnel on the right side and move on to third parties. 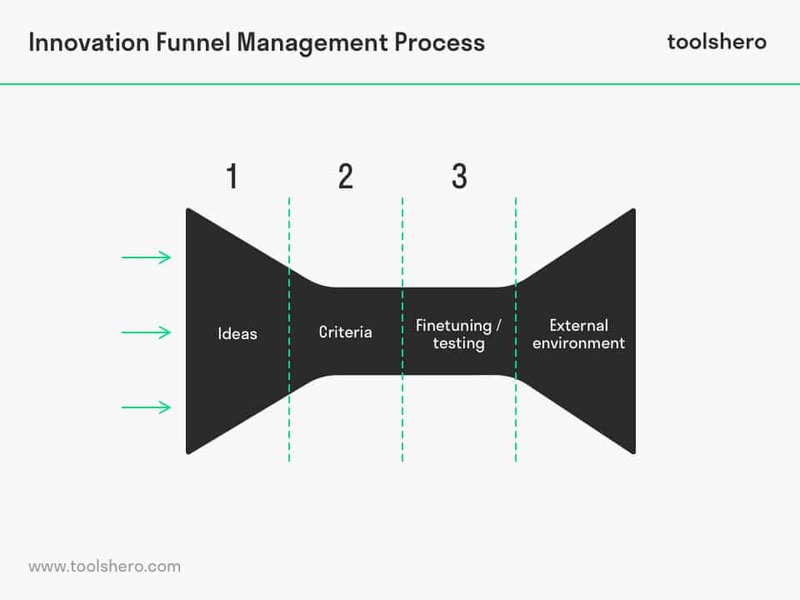 The Innovation Funnel Management Process demands that each idea is carefully and constantly screened and compared to several rules, criteria, and filters. Here, it’s important that the Innovation Funnel Management Process isn’t limited to generating new innovations or processes, but also that there are ongoing projects that must constantly be scrutinised by means of the previously established criteria to ensure that they function optimally. To what extent does the idea meet the customer’s ideas and wishes? Does the idea fit within the strategy or the strategic objectives (SMART)? To what extent is the idea risky? The criteria must be adjusted depending on the type of idea or proposal. The steps below can be used to start using the Innovation Funnel actively. The funnel is used to describe the steps in developing a process or product. The goal is to create processes or products that meet market needs and that can be produced in an economically profitable way. The goal of this first step or phase is to gather as many ideas as possible. In doing so, the organisation expands its knowledge and availability of information. The more ideas the organisation can come up with, the larger the number of solutions and the better the quality of these solutions. Gathering information is vital and relatively easy. Information can be found at competitors, partners or institutes, in studies, and at university connections. Market research also yields valuable information. Sometimes, this requires travel to the areas where the demographic can be found. To efficiently go through this phase of the Innovation Funnel, a clear perspective on the objectives must have been established beforehand. The organisation needs to understand the possibilities and have the pure intention to actualise ideas. The ideas come from both the internal and external environment of the organisation. Due to the constant stream of ideas, these must be carefully studied and connections must be made between the idea and the objectives. In this phase of the Innovation Funnel, the ideas the organisation has developed in the first phase are screened. The screening process encompasses matching the ideas with the goals of the organisation to check whether they have added value. Subsequently, an evaluation is made of the yields (cost-benefit analysis), the risks (matrix), to then decide which ideas must be selected. Testing the product or service with real customers also begins in this phase. After establishing and selecting the good ideas, resources must be allocated to the most promising and viable plans and opportunities. These resources are scarce, so careful identification of the yields is an absolute necessity. It’s also important that the ideas position the company positively to enable future projects. In this phase, the organisation ensures that the selected ideas are tuned to the company’s objectives that were drawn up when the company was started. The first evaluations and reviews of the test phase are also expected in this phase. If everything went well, the new product, idea, or the new service can be launched on the market. The funnel shape is easy to use and therefore is also often used by organisations that specialise in more than one industry. However, the Innovation Funnel doesn’t help to establish the requirements for developing a new product or service. The user must be careful that the Innovation Funnel doesn’t discourage creativity. This can occur because new ideas are rejected at an early stage when they don’t meet the criteria. The model encourages development of the safe ideas, rather than the creative ideas. Innovation comes in many forms. A website can make the entire order process fully automatic, new processes such as automated malware combating are designed, and organisations nowadays have tools to boost the sales leads. All these innovations result in improvements and increase the efficiency and effectiveness of the internal processes. These possibilities arise from multiple sources. Sales representatives harass their customers about new products and services, and private equity companies bring the companies in their portfolio under the attention looking for potential adopters who wish to be part of an up-and-coming system. In short, commercial companies have countless possibilities to innovate. The Innovation Funnel helps them to structure the chaos of innovative ideas and carefully select plans that display viability, efficiency, and effectiveness. What do you think? Do you recognise the explanation of the Innovation Funnel Management Process? How do you shape innovation within your organisation, or how do you recognise innovation within the company where you work? Which rules do you believe are crucial in the innovation game? Do you have any tips or additional comments? Du Preez, N. D., & Louw, L. (2008, July). A framework for managing the innovation process. In PICMET’08-2008 Portland International Conference on Management of Engineering & Technology (pp. 546-558). IEEE. Flynn, M., Dooley, L., O’sullivan, D., & Cormican, K. (2003). Idea management for organisational innovation. International Journal of innovation management, 7(04), 417-442.